Evaluating your business performance helps you identify and fix issues before they become real problems. With GuestReview you can track customer satisfaction. The service lets you send out personalised surveys with custom questions and easily publish selected reviews and guestbook entries to your web site. Why should I stay at your lodging and not the one down the road? Customers trust independent reviews. 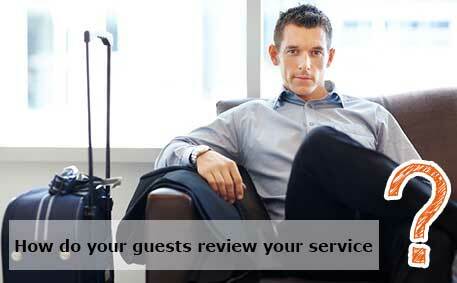 Thus, showing what other guests have said about you on your web site can increase your online bookings. GuestReview offers an easy and simple way to enhance your website with a live guestbook and up-to-date reviews. 70% of global consumers trust consumer opinions posted online. 54% of the online users look for reviews on company websites. Our goal is to make your life easier and your business more profitable. We provide cost effective and powerful tools for lodging hosts, booking agents and tourism associations. If you need a custom solution, please do not hesitate to contact us. GuestReview allows hosts to track customer satisfaction and enhances lodging websites with a live guestbook and up-to-date reviews. Beds24.com online booking system, property management and channel manager are tailored to the needs of small to medium sized lodgings. We offer solutions for owner operators, booking agents and tourism associations.